Meanwhile, Pirate Kitty and her friends land on an island to rest, where Kitty encounters Bamf, a teleporting, puckish elf while Colossus frees a genie named Storm from her enchanted bottle. Both agree to join the quest to defeat Dark Phoenix just as an ogre named Mean appears, declaring that Cyclops stole Jean from him, but Lockheed convinces Mean to join their quest as well. 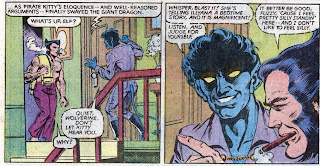 As the group travels on, the rest of the X-Men join Wolverine and Nightcrawler outside Illyana's room. Pirate Kitty and her companions are suddenly attacked by Dark Phoenix, and together, manage to hold her off long enough for Xavier to use the soul crystal to defeat the darkness inside her. 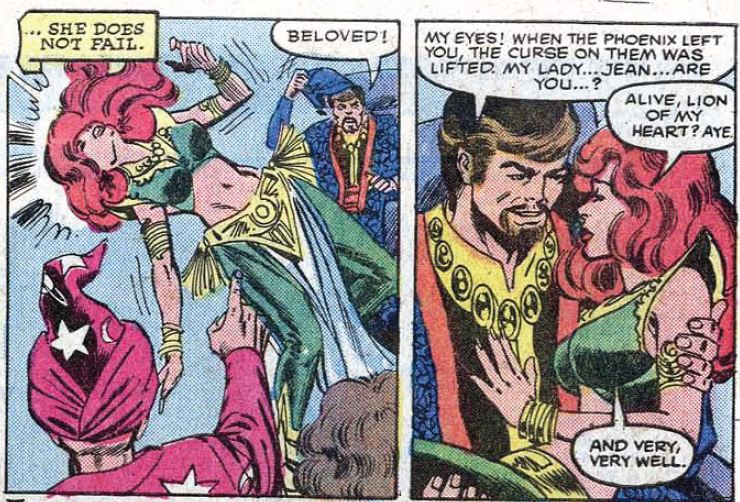 Princess Jean is restored and the curse on Cyclops is lifted, and they all live happily after. As Kitty and Colossus leave a sleeping Illyana, Kitty is mortified to find the rest of the team was listening in on her story, but Cyclops tells her it was great, and thanks her for the ending. 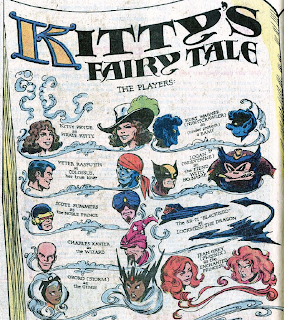 "Kitty's Fairy Tale", though not a groundbreaking epic like "Dark Phoenix Saga" or "Days of Future Past", is generally considered an all-time classic by most X-Fans and is often cited as being one of many fans' favorite issues. 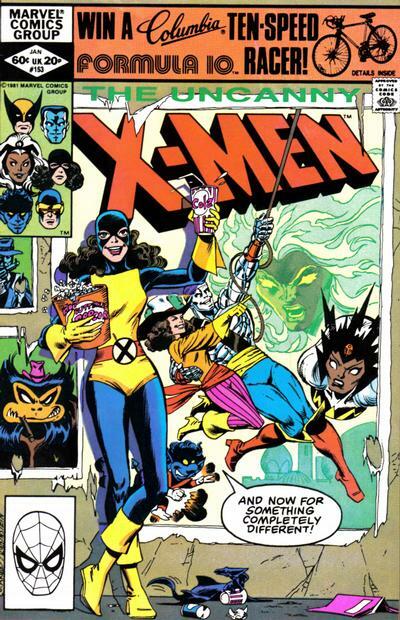 Because this is comics, the world of Kitty's fairy tale was later revealed, in the third issue of Nightcrawler's limited series, to exist in an alternate reality, one labeled in Earth-5311 in an issue of the Official Handbook of the Marvel Universe (though the events of Kitty's story in this issue are still considered fictional within the Marvel Universe; only by mere coincidence do some of the places and inhabitants of Earth-5311 star in it). The Pini fairies in Kitty's fairy tale world are named for Wendy and Richard Pini, the creators of Elfquest. Kitty is also wearing an Elfquest t-shirt throughout the issue. In her story Kitty recasts the X-Men's Blackbird jet as a dragon named Lockheed; this will later be the name she gives the purple alien dragon she meets during the Brood saga. 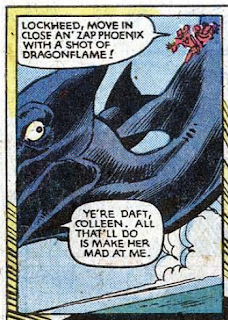 Also, in a neat bit, Lockheed the dragon references the events of issue #143, in which Kitty severely damaged the Blackbird jet. As the X-Men once again work to repair damage done to the mansion (this time by the Sentinels and the Hellfire Club in issues #151-152), Professor X notes that they are running low on the funds and expertise necessary to effect the proper repairs. Colossus' sister Illyana is still living with him at the mansion following the events of issues #145-147. Apparently she managed to evade capture by the Hellfire Club last issue. 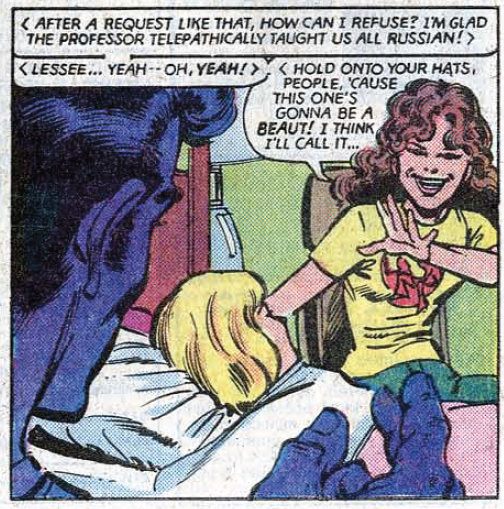 Professor X has telepathically taught the X-Men Russian so they can communicate with Illyana, though it probably would have been easier to just teach her English. Carol Danvers is still hanging with the X-Men, following the events of Avengers Annual #10. Illyana has a pretty sweet Fozzie Bear stuffed animal. Lockheed the dragon occasionally refers to Pirate Kitty as "Colleen". I have no idea if this is some kind of colloquialism that is no longer used, or an Irish thing (Lockheed speaks with the patented Claremont Irish brogue for some reason) or what. Claremont revisits "Dark Phoenix" again, using it as the basis for Kitty's story. Also, this issue marks the first appearance of a device which Claremont will use often moving forward: a cluster of speech bubbles in which the speakers are unknown. Kitty provides a happy ending for the "Dark Phoenix Saga". Dave Cockrum on "Kitty's Fairy Tale"
"That's one of my favourites. Chris and I co-plotted it, but it was my idea in the first place. I had just been re-reading my T.H.U.N.D.E.R Agents collection and there's a story in there called 'Weed's Fairy Tale'...in that story he was telling his niece and nephew a fairy tale and he was using the T.H.U.N.D.E.R Agents characters...It was a fun story and I said to Chris, 'Why don't we do our own fairy tale?' I explained my reasoning and he jumped right on it. Next thing you know he's giving me so much material that it should be a double-sized issue or a two-issue arc. I think Louise Simonson was editor then, and she says, 'Well, we haven't had a chance to advertise it as a double-sized issue and I don't think the powers-that-be would think it is a strong enough story to do over two issues.' So we had to cut the material down some. There'd been a fight involving fairytale Avengers as part of the storyline, but we cut that out entirely. I think it's one of our most popular issues." 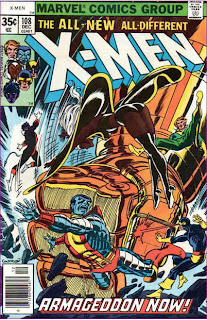 This issue is without a doubt Dave Cockrum's X-Men opus. It is a story written to his swashbuckling sensibilities, to his love of whimsy and fantasy. 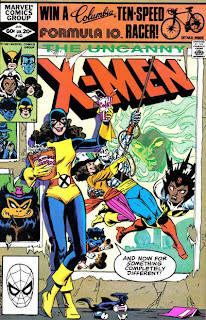 As a result, he turns in some of his best art since returning to the book to help craft a tale that has become an X-Men classic (Claremont clearly has a lot of affection for this issue as well: he chose it for inclusion in his Marvel Visionaries volume). The amount of fun both creators must have had in crafting this story is clearly evident on the pages. But the first few times I read this issue when I was a teenager, I wasn't a big fan of it. At the time, I was very concerned with comic books (and science fiction in general) being taken "seriously" and as a result, I tended to look down on any whimsical stories for fear they would reinforce the notion that comics are just for kids (this is also why I have read very little Douglas Adams or Terry Pratchett; I didn't like a lot of humor in my science fiction, either). I've since learned my lesson, and returning to this issue again, I have much more appreciation of it than I did when I was younger. Claremont gets a lot of flak, in some cases deservedly so, for returning so often to the "Dark Phoenix" well, especially during this period, but returning to it here in order to present a happy ending is worth the repetition. Scott's appreciation of Kitty for presenting a world in which he and Jean live happily ever after has a certain poignancy I completely missed in past readings. In terms of the grand X-Men narrative, this story probably isn't required reading: nothing terribly significant or groundbreaking happens to any of the characters. But to overlook it would be a shame, as it's simply twenty-two exceptional pages of good old-fashioned comic book fun. The return of Corsair and the beginning of the Brood arc. It's issues like this one that make me a little upset that Jean was eventually brought back. Most of the time her return doesn't bug me all that much, as it's something you expect in comics, but Cyclops's acceptance of his loss and his somewhat touching scene with Kitty at the end kind of cheapens the impending resurrection in my eyes. However, I've always thought it odd that on the last page, there's some reference in the narration to Cyclops knowing that among the many alternate timelines in the universe, there's one where he and Jean did live happily ever after. What a bizarre thing to think, even for a comic book character! 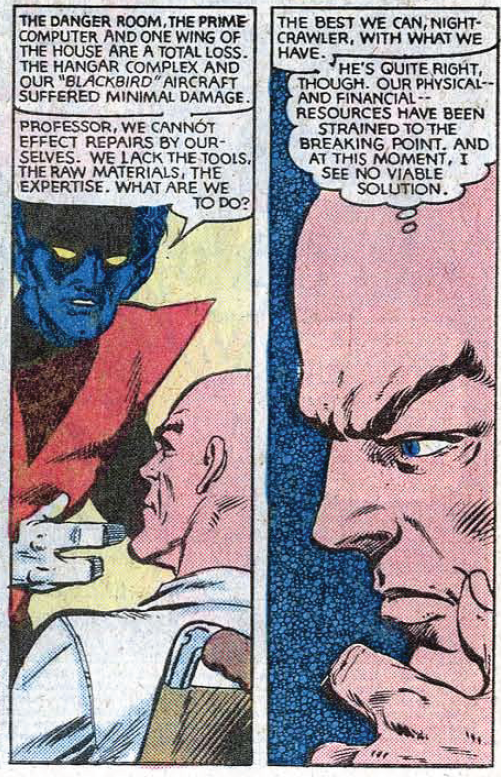 "...Professor X notes that they are running low on the funds and expertise necessary to effect the proper repairs." I wonder why he didn't ask Angel for help this time? Obviously for story reasons Claremont wants to move the x-Men to a new base, but I feel like some explanation should've been given within the story, especially since we've already seen Xavier ask Angel for a loan once not all that long ago. Maybe he just doesn't want to impose again? Or he thinks there's still some bad blood following Angel's departure? Anyway, I would've liked to have seen it addressed. "Apparently [Illyana] managed to evade capture by the Hellfire Club last issue." Never really thought about that... There's something equally frustrating and funny about how Claremont tends to forget about whole characters sometimes. Though in this case, I would guess that maybe Claremont assumed Illyana had returned to Russia, but later changed his mind? Within the context of the story, maybe Banshee took her along with Theresa on that trip to Cassidy Keep to meet the leprechauns. "...in the third issue of Nightcrawler's limited series..."
Will you be reviewing this? 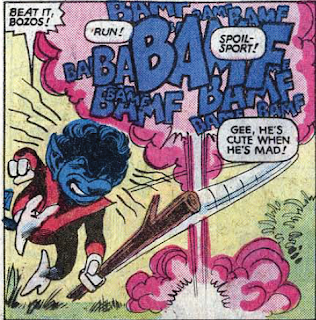 I've never read it and I really know nothing about it except that it's written and drawn by Dave Cockrum and features Nightcrawler in some dimension-hopping adventure. @Matt: What a bizarre thing to think, even for a comic book character! To be fair, *I* tend to wonder about what my alternate selves are up to, but then again, I probably read a lot more comics than Cyclops does. I wonder why he didn't ask Angel for help this time? Yeah, I would have liked an explanation too, especially since it seems like the only answer is because Claremont forgot/is ignoring Angel. Though in this case, I would guess that maybe Claremont assumed Illyana had returned to Russia, but later changed his mind? Yeah, I wouldn't be surprised if he just brought her back after Cockrum hatched the fairy tale idea, to give Kitty someone to tell the tale to. And then of course, she stuck around and became Magik, so maybe we have "Kitty's Fairy Tale" to thank for everything that's coming with Illyana. Within the context of the story, maybe Banshee took her along with Theresa on that trip to Cassidy Keep to meet the leprechauns. Will you be reviewing this? Probably. I've never read it either, but it occurs at a time before the various X-Men limited series exploded in number, so it shouldn't be too hard to fit it in. And from what I've heard, it's both kinda fun and kinda horrible, which should make for an interesting read/post. I think "colleen" is slang for "girl" in Irish. @Jason: I think "colleen" is slang for "girl" in Irish. That would make sense. Thanks! I have not read this issue (shocker) but I have a feeling I wouldn't like it. Reimagining X-Men as a fairy tale is clever but framing it as a made-up bedtime story eliminates all narrative urgency which tends to kill a story for me. Frankly, it isn't much better than a dream sequence. (A little better in that you know going in the events aren't real). Oddly, I saw an episode of Scrubs that was like this issue (complete with a character getting sucked into the story listening outside the bedroom). And it probably pulled it off in the best way possible for me. It was still a bed time story but the story mimicked the hospital events of the hospital that day, events that were unknown to the viewer. So at least you were invested in the story because, in some form, the events happened and mattered and you didn't know how it ended. Ahh... The whole regular creative team is back and it's a great issue. It's a bit of an abrupt ending, and I do kind-of have a problem with the use of Jean that we'll get to, but in general I love it in both concept and exectution. Pirate Kitty's fashion sense is just as bad as Real Kitty's. What happened to Lee Forrester? Lockheed the dragon references the events of issue #143, in which Kitty severely damaged the Blackbird jet. Kitty's trick of concentrating and raising Lockheed from the ocean is also a callback to her "use the Force" fake-out with Colossus at the end of #150. Yeah. That's kind-of a retroactive "oops" to me. "Colleen" is an Irish term for "lass" and I thought it was weird mostly because it felt like Claremont was going for Scottish rather than Irish. I've since learned my lesson, and returning to this issue again, I have much more appreciation of it than I did when I was younger. I hope you've read some Douglas Adams and Terry Pratchett, too. Actually, I must say the only Pratchett I've ever read is his & Neil Gaiman's Good Omens, which was enjoyable if a bit precious as those things can be, but I never partook as omnivorously from the SF/fantasy prose canon as many of my friends. Scott's appreciation of Kitty for presenting a world in which he and Jean live happily ever after has a certain poignancy I completely missed in past readings. You can read it that way, but it actually seems to me like Scott's just being generous. As much as I like the issue I'll admit that it strikes me a little insensitive of Kitty to rewrite Jean's story like that, making it a "happily ever after". I can see it the other way, yeah, and I want to; while Kitty did share that one adventure with Jean and the rest of them after "first contact", though, she only showed up at the mansion's doorstep while the X-Men were at Jean's funeral, so it doesn't quite feel like she's earned the right to co-opt Jean's story this way. In terms of the grand X-Men narrative, this story probably isn't required reading: nothing terribly significant or groundbreaking happens to any of the characters. But to overlook it would be a shame, as it's simply twenty-two exceptional pages of good old-fashioned comic book fun. That's exactly why it's required reading. It may not belong to any of the smaller sagas within the larger one, but the better of the single-issue stories that spelled them, especially the downtime ones like "Kitty's Fairy Tale", are an essential part of what make the Wolfman / Pérez Titans, the Barr / Aparo/Davis Outsiders, and the granddaddy Claremont / Cockrum/Byrne/Cockrum/Smith X-Men so brilliant, just as such moments within an issue like the night before the battle in #137 do. The motif was picked up from 1980s superhero team books and practically codified as an essential blueprint the next decade, often explicitly in stuff like Robinson's Starman. Matt: It's issues like this one that make me a little upset that Jean was eventually brought back. Then again, I don't have the emotional relationship with the original X-Men, not having been around then, that the fans 10 years older than I have, nor do I have the emotional relationship with stories published after Jean returned that fans 10 years younger than I have. We could probably all but scientifically prove that stuff published (or grandfathered in as extant backstory) when we were kids is "what really happened" and all the rest, even stuff we like if not love, is merely later storytellers' interpretations. Matt: However, I've always thought it odd that on the last page, there's some reference in the narration to Cyclops knowing that among the many alternate timelines in the universe, there's one where he and Jean did live happily ever after. Teebore: To be fair, *I* tend to wonder about what my alternate selves are up to, but then again, I probably read a lot more comics than Cyclops does. I do too, Teebore, both those things. Cyclops' statement doesn't seem that strange to me, either, because while he's not read all the comics we've read he's lived them. I must say that that's my recollection; I don't think I've read it since it came out in 1985. I forgot to mention that my other problem with the story is that all the characters so clearly speak with Claremont's cadences and tics rather than Kitty's. While I get that we're peering through a "dissolve" and experiencing the story itself rather than Kitty's literal narration of it, that was a bit distracting at times. 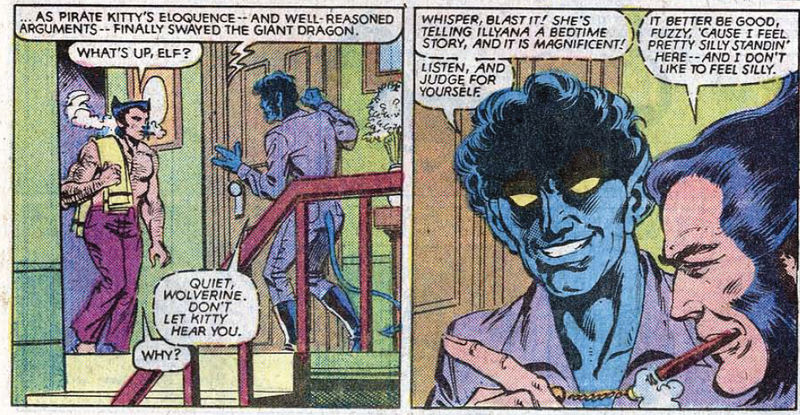 I also doubt very much that Kitty would have said aloud to Illyana or Peter that Pirate Kitty was "enjoying a nifty -- and very naughty -- dream". @Dr. Bitz: I have not read this issue (shocker) but I have a feeling I wouldn't like it. Why do you hate fun and whimsy? Seriously though, you're absolutely right about this issue having no narrative urgency - which is one of the reasons I said it's not required reading. It's fun and well-crafted, but that's all it is. If that's enough for a reader, great, but if it's not, I can appreciate that, too. That Scrubs episode sounds interesting. I haven't seen it, but I like the idea of a fairy tale adaptation of a story the audience doesn't already know. @Blam: What happened to Lee Forrester? Good question. I'm kind of appalled that I've completely forgotten about her and failed to mention her absence. Plus, Carol is wearing a Captain (or Mary) Marvel insignia shirt — backwards, perhaps out of trademark fudging — which is fitting for the once and future Ms. Marvel. I meant to mention that, though I think I completely missed that it was backwards. I hope you've read some Douglas Adams and Terry Pratchett, too. I haven't read any Adams (yet) but I have read some Pratchett. First Good Omens, which I loved, then Small Gods, which was fine but I didn't enjoy as much, making me suspect that I may have appreciated the Gaiman side of Good Omens more than the Pratchett side. so it doesn't quite feel like she's earned the right to co-opt Jean's story this way. I can definitely appreciate that reading of the ending, and I may have even subconsciously read it that way as a teenager, furthering my initial distaste for the issue. Couldn't agree more with your comments regarding the importance/influence of the one-off "downtime" issues to comics. 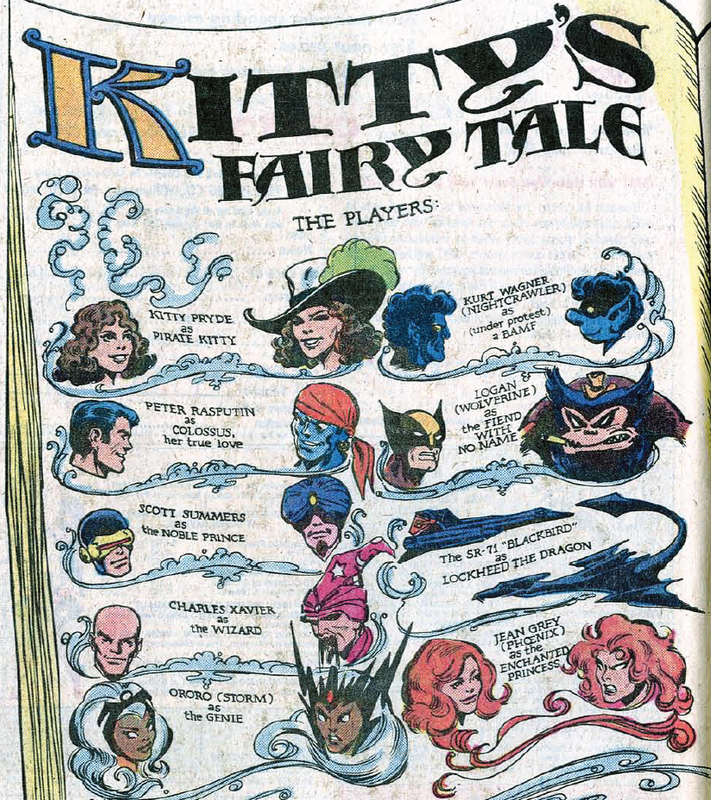 I also doubt very much that Kitty would have said aloud to Illyana or Peter that Pirate Kitty was "enjoying a nifty -- and very naughty -- dream". I meant to point that out as well. It's not difficult to put aside the conceit that while this is framed as a story for Illyana it's really a story for us, the readers, but a line like that draws attention to the conceit, to the story's detriment. Teebore: I meant to mention that, though I think I completely missed that it was backwards. VW: santiam — Father Christmas in the Green Eggs and Ham universe? I can't believe it took me this long to think of this ... but could Lockheed in the story be Irish because Banshee was most often the one repairing the Blackbird (including at least once since Kitty had been at the school)?